Cutting perfectly even cake layers has never been easier. Leveling and torting a cake sounds intimidating, but it’s actually pretty simple. 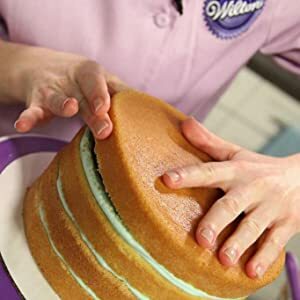 Use the Wilton Cake leveler to define the size of each layer. Purple side adjustments allow you to choose the thickness of each layer. Adjust up or down for custom sizing. Simply slide the leveler through your cake to remove crown and level and torte layers. Stack the cake layers with icing, fruit, pudding or other fillings between to add flavor and height to your cake. Choose from 10 adjustable heights. Move the purple adjustments up or down to fit your cake. 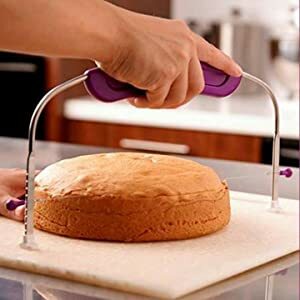 Purple handle fits comfortably in your hand, making leveling your cake even easier. 12 x 6.25 inch Cake leveler is made to torte and level cakes up to 10 inches wide.